Kavitha Arms said she chose Clemson University for the in-state tuition, its reputation for academics and engineering, and because it was the post-high school destination for many of her friends. Now she can’t imagine having gone anywhere else. Kavitha Arms is an Outstanding Young Alumna from the College of Engineering, Computing and Applied Sciences. Arms graduated in 2001 with a Bachelor of Science in chemical engineering and stayed in the Upstate of South Carolina. 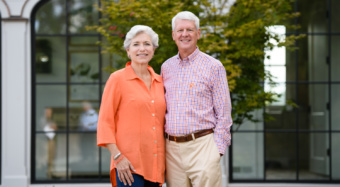 She is doing well at General Electric and has joined the advisory board that helps guide Clemson’s Department of Chemical and Biomolecular Engineering. She was among those honored in 2018 with the Outstanding Young Alumni Award from the College of Engineering, Computing and Applied Sciences. Arms credited her parents, KD and Dhanam Ganesan, with starting from nothing and producing two successful children, both Clemson University alumni. Arms has been working at for GE at 13 years, most of that time with GE Power. She recently accepted a new job with GE Corporate, where she leads the chemical management and product stewardship organization for the entire portfolio of GE technologies. As part of the job, she develops and implements policies that ensure GE complies with or surpasses regulatory and legislative obligations as they relate to chemicals. Arms was born in India and moved to the Netherlands when she was 8 years old. She has one younger brother, Bharat Ganesan, who has a Bachelor of Science in industrial engineering from Clemson. The family moved to Greenville when her father accepted a job at Fluor Corp. Arms enrolled in the 10th grade at Mauldin High School, and her mother got a job at Bosch. Arms described her parents as hardworking, humble and passionate about their children’s success. “When I think about their struggles, to say that they paved the way, is quite an understatement,” she said. Arms also draws inspiration from her husband, Chris, a Greenville native who worked full-time while pursuing his college degrees. He has two associate’s degrees from Greenville Technical College and a bachelor’s degree in engineering technology management from the University of South Carolina Upstate. He now works as an industrial engineer at Michelin North America. Chris Arms said he’s happy for his wife’s success. In their free time, the Armses enjoy traveling the world and count a trip to Australia among their favorite destinations so far. They are also aunt-and-uncle to several children and contribute their time and treasure to a variety of causes, including United Way, Hands On Greenville, and GE’s People with Disabilities Network .